If you were to stop and count the number of times you lift your baby every day you’d probably be surprised at how high the number is. Although a newborn baby only weighs around 10 pounds, many new parents are not aware that the repetitive bending and lifting that is part and parcel of being a new parent can lead to back and neck pain. To reduce the risk of developing aches and pains I would like to share some tips on the best way to lift your baby. Since this is a move you repeat so many times every single day, you definitely want to learn how to do this with the least amount of effort and in a way that prevents strain on your body. Stand close with your body directly facing the baby so you don’t have to twist your back when reaching and lifting. Bend your knees and hips rather than your back. Prior to lifting place your bags or telephone down to leave your hands free so you can lift your baby with both hands. 1. 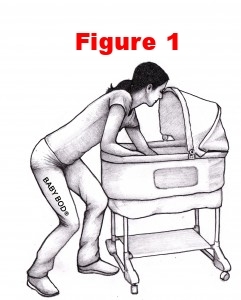 Stand close to the crib and right next to where your baby is resting to avoid twisting your back (see figure 1). 2. Keep your feet shoulder width apart and knees slightly bent. You can place one foot in front of the other foot, as in a mini-lunge position. Or you can place one foot on top of a stool to prevent straining your lower back. 3. Make sure you are in good alignment by centering your rib cage over your pelvis prior to bending over (Chapter 11 of my book BabyBod includes a handy Alignment Check). 4. Bend at your knees and hips instead of your back. Bow down towards your child by bending in the hips and knees until you feel you can get a secure grasp on your baby. 5. EXHALE as you lift your baby with both arms and bring him or her close to your chest (figure 2). 6. Then straighten your knees and hips to return to a full standing position (figure 3). 7. Keep your baby close to your chest as you carry him or her around. 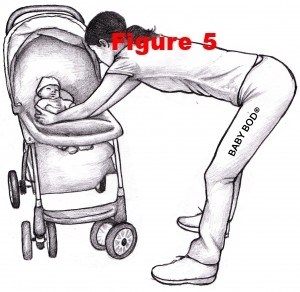 Picking your baby up out of a stroller is similar to picking your baby up out of a crib (figure 4). Before you pick up your baby please make sure to lock the stroller wheels and get rid of any bags you are carrying to leave your hands free so you can lift the baby with both hands. Then follow the directions above on how to lift. HERE ARE SOME COMMON MISTAKES PARENTS MAKE WHEN LIFTING THEIR BABY OUT OF A CRIB OR STROLLER (FIGURE 5). CAN YOU IDENTIFY SOME OF THE MISTAKES? ANSWER: YOU CAN SEE MOM IS TOO FAR AWAY FROM THE STROLLER; SHE IS BENDING TOO MUCH IN HER BACK AND HER KNEES ARE NOT BENT. IF SHE LIFTS HER BABY OUT OF THE STROLLER LIKE THIS EVERY TIME, SHE RISKS STRAINING HER BACK. Stand directly in front of the carrier to avoid twisting your back (figure 6). Keep your feet shoulder-width apart and your knees slightly bent. You can place one foot in front of the other, like in a mini-lunge position. Make sure you are in good alignment by centering your rib cage over your pelvis prior to bending over. Bend at your knees and hips, not your back. Bow down towards the baby carrier by bending in the hips and knees until you feel you can get a secure grasp on the baby carrier. Slide the carrier closer to your body (figure 7). Place your hands on either end of the seat, as if you were carrying a basket of laundry. Try not to lift the carrier from the center handle (figure 8). 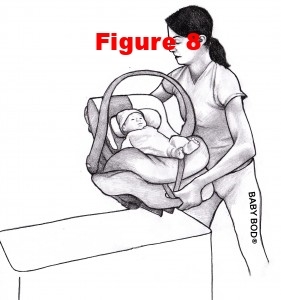 EXHALE as you lift the baby carrier (figure 9). If you need to turn, turn your entire body by circle stepping with your feet or pivoting with your feet; don’t twist your back. When you need to put down a baby carrier, try doing the reverse. 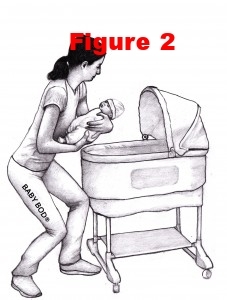 CAN YOU FIND THREE THINGS WRONG WITH THE WAY THE WOMAN IN THE ILLUSTRATION BELOW (FIGURE 10) IS LIFTING HER BABY IN THE CAR SEAT? ANSWER: IN THIS PICTURE YOU CAN SEE THAT MOM IS TALKING ON THE PHONE, SHE ISN’T FACING THE CARRIER AND IS USING ONLY ONE HAND TO PICK THE BABY UP. THIS COULD LEAD TO A TERRIBLE ACCIDENT - MOM COULD DROP THE BABY OR STRAIN HER BACK. It is important to remember to take care of your body so that you can take care of your baby – it is hard to look after a baby when you have aches and pains. In my book, Baby Bod®, I explain many other ways to take care of your body while taking care of your baby. In Chapter 16 you can learn how to set up an ergonomic nursery while Chapter 17 includes a lot of other examples of how to lift and carry your baby safely.